This chocolate velvet pie is my wife's favorite dessert. It comes with those special feelings that holiday baked goods always have, and it gets bonus points for being adaptable. My mother-in-law served it the first time I spent Passover with Navah's family, and I've made it almost every year since then for Navah's birthday - even with all the various eating restrictions we've worked with over time. Unfortunately, the making of it has involved a lot of cursing (from me). I can never get the chocolate to melt well and fold into the eggs without getting fudgy, and then it breaks up into little bits throughout the mousse. Navah says it's delicious and she loves it anyway, but it drives me crazy every time. Once I started the Project Pie challenge, I realized it was time - once and for all - to get this pie right. So I asked my mother-in-law if we could make it together this Passover. She took out this stained piece of paper with the recipe on it and told me that Navah's aunt (her sister-in-law) found the recipe in a Seventeen magazine when she was sixteen years old, and they've used it ever since, adapting it slightly to meet their Passover needs (aka non-dairy so that it can be served with the meat meal). Navah's mom learned to make it in her mother-in-law's kitchen about 40 years before she taught me to make it in hers. We made it with non-dairy whipping cream and kosher for passover semi-sweet baking chocolate, and it turned out perfectly. 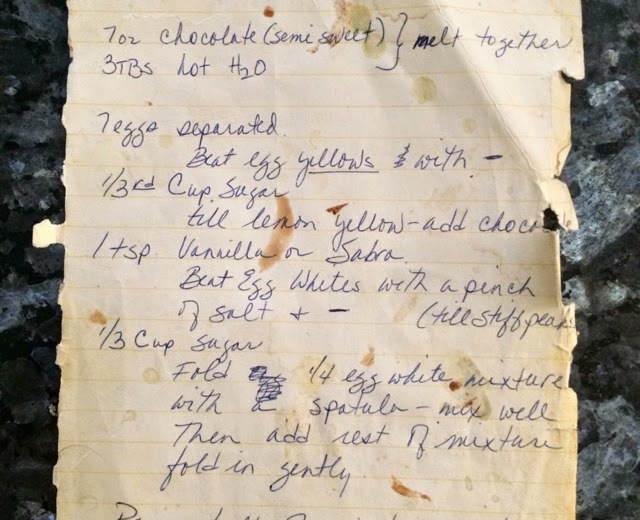 I'm going to have to try it at home again with the ingredients I generally use - coconut cream and sunspire grain-sweetened chocolate chips - to see if precisely following my mother-in-law's method will turn out a smoother pie. Of course, you can make this with regular whipping cream if dairy isn't an issue. 2. In a large mixing bowl, beat the egg whites with a pinch of salt until stiff peaks form. Gently fold in 1/3 cup of sugar and set aside. 3. In a separate bowl, beat the egg yolks with the other 1/3 cup sugar until lemon yellow. 4. Melt the chocolate and water over the stove or in the microwave. Watch closely and stop the heat (either on the stove or in the microwave) before the chocolate has completely melted. Stir to complete the melting process. 5. Mix the melted chocolate into the egg yolks. 6. Gently fold the chocolate mixture into the egg whites that you set aside earlier. 7. Pour half of the mix into a greased pie plate and bake in the preheated oven for 20 minutes. This chocolate crust should rise a bit but will sink while you let it cool (for at least 1 hour). 8. Once the crust is cool, whip one cup of the cream, reserving 1/4 cup for garnish. 9. Add the remaining 3/4 cup whipped cream to the remaining chocolate mixture and pour into the pie crust. 10. Place in the refrigerator for 2 hours - overnight. 11. Serve with a dollop of whipped cream. p.s. As the snow melts and Spring comes to Vermont in earnest, this is something I'll be worrying about again soon.